The Corp cannot rez non-ice cards during the Runner's turn. 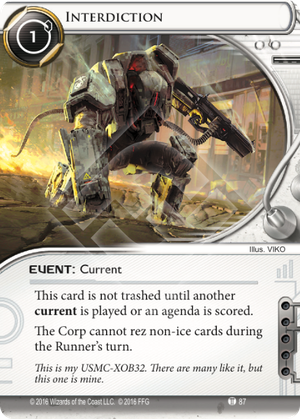 This card limits the surprises the Corp can spring on a runner. If that server has The Pokemon Trainer or Doc Brown in it, they will have to let you know ahead of time in order for either of them to do any good. It serves as an influence-free version of PSK's Glittery Variety Show, though offering no way of getting into the server with the previously-rezed Psychic Detective. In some ways, Intervention is like the Councilman to PSK's GVS's Political Operative. However.... I am really here to talk about the tube on the left side of the art. I can see it as nothing else besides a rat-tail belonging to the suit's wearer. The US is sending humanoid-sized rats in power armor as peacekeepers, like the Space Skaven I always wanted. The flavor text is a reference to the movie UHF from 'Weird Al' Yankovic, from 1989. The character Stanley Spadowski talk about his mop. "This mop is mine. There are many like it, but this one is mine."